Hi everyone! After a series of short plane rides, we are in Ecuador now and having a great time together. We're staying in Cuenca, the second largest city in Ecuador, nestled up in the mountains in the southern part of the country. It's a cool city that's been welcoming to us, perhaps because of all the expats that seem to be here. The streets are beautiful, lined with old buildings and bordered with stone streets and sidewalks. It's a walkable city, too. Except for the ride from the airport, we haven't had to take a cab anywhere. I'll write a full review at the end of the trip, but today I wanted to write about our first foray into two new experiences for us: Airbnb and tiny houses. I'd heard of Airbnb before but didn't really have much of an idea of what it was until I heard a Stacking Benjamins podcast, in which one of the guests mentioned she always traveled via Airbnb. She said the service offered a place much nicer than a hotel for a lot less than the cost of a hotel. That sounded pretty good to me, so I checked out the website. I'm no expert, but the service seems to allow individuals to rent out either a room, a guesthouse, or an entire house on a short term basis, with a fee going to Airbnb for the listing. 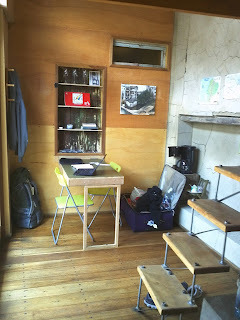 When we were looking around for places to stay in Ecuador, we thought we'd check out what we could find on Airbnb and found this quirky little place for only $15 a night. 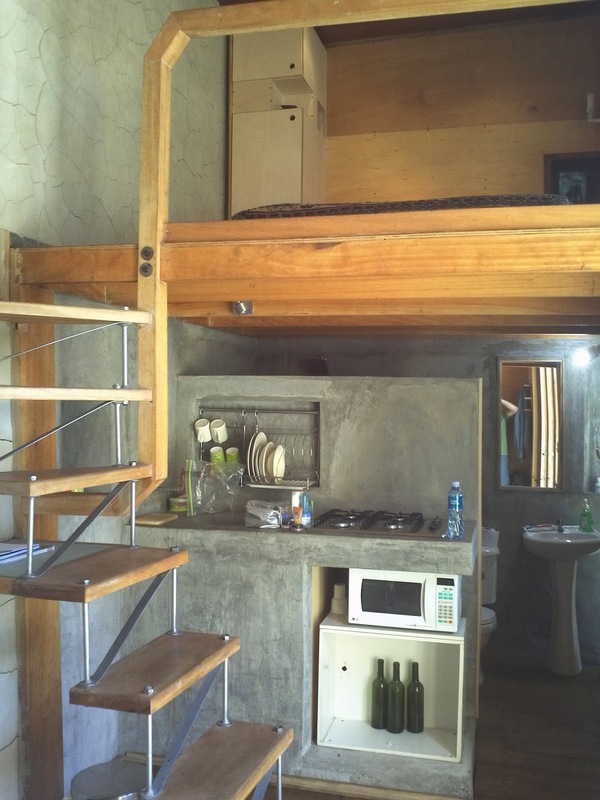 It's a tiny little loft that's unlike anything else we would have rented at a hotel or hostel. The owner, Manolo, is really hospitable, too. He and his son are taking us to a soccer game later this week. Try getting that at a Best Western. To give some context, I should mention that I have a bit of an obsession with tiny homes. I saw a Tumbleweed video a few years ago and was immediately hooked. Now I get my fix on The Tiny House Blog, and about once a month I'll try to convince my wife that we should live in a tiny home full time. I force regular conversations about building a tiny home on wheels, or maybe converting our detached garage into an artsy studio. Wisely, she has some doubts. I get enthused about the idea of things often before really considering the what the reality of that idea will feel like. Would we really enjoy living in less than 200 square feet? Would purging ourselves of the majority of our clothes and possessions really be as liberating as I think it would be? 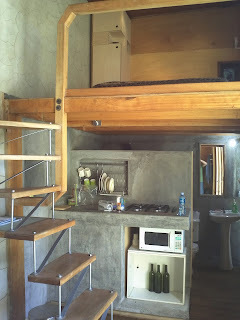 Well, this little loft in Ecuador seemed to offer a chance to test drive tiny living for a week. And at $158 for the entire week (including the Airbnb fee), how could we not give it a go? We personally love the allure of the place, with all the vertical space and the loft area for sleeping. The owner built it himself so it has a unique, DIY feel to a lot of it, which we dig but it probably isn't to everyone's taste. There are cool little touches, like a table that folds out from the wall like a murphy bed and two folding chairs that hang from hooks when you want more space. And the handmade staircase is just cool. It's a little bit like living in a dorm room again (with, in my case, the dorm-mate of my dreams). There's just enough space for everything, as long as we put things back where they should be. On the downside, the handmade staircase seems incredibly dangerous, too, with the complete lack of a handrail and all. I am making deals with God each time I get out of bed in the morning. And while living in such a small space is great for a week, I can see already that it would be tense if we tried doing this full time. 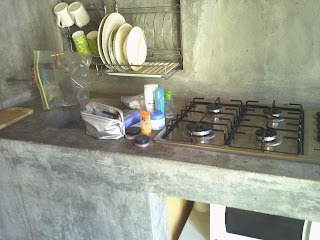 The main drawback seems to be a lack of counter space: there just aren't a lot of flat surfaces on which to put things. Astute observers will notice Mrs. Done by Forty's makeup and other girly products taking up the tiny counter space we have in the kitchen. Not a big deal until, you know, we want to cook. Then I remember the fact that we have two golden retrievers and, someday, will probably have two munchkins running around. It seems inevitable that I'd trip over one of those four little guys at least once a day, and there's a good chance we'd be testing the durability of our dependents when they fell out of the loft. So, it seems the missus was right again. While a cool idea and something that might even work for us in another lifetime, I think tiny house living might not be in the cards for us. Maybe we can strike a compromise and build one of the Tumbleweed small houses (bigger than 120 square feet, but all under 900). Here is our favorite, the B-53. At 883 square feet, with enclosed bedrooms, and a staircase that's less likely to send me to my death, what's not to love? Well, that's all for now. Thanks for checking in and, for those of you who have blogs I follow, I'm looking forward to catching up soon. I am obsessed with Tiny Homes too! I always dream of living in one, and if I weren't planning on having kids one day I'd buy one now. That is so cool that you're trying one out - I'm really jealous! Phoebe, I had a feeling you might also be into tiny houses. Our new idea is to set up a bed and breakfast that rents out tiny homes out back of the bigger house we live in. All these ideas...only one life to live. That's brilliant. You would totally attract interesting tiny-house lovers and get to meet the neatest people! Plus, the utilities and maintenance would be nada. I would come and stay in one of your tiny houses. After living in a VW van for a month with two kids, we did get used to the lack of space, but so much time was taken up with reconfiguration (shifting the girly stuff to a drawer so that you can cook and vice versa). Plus, you need space from kids (or at least I do). Camping provided that as we just sent them into the woods searching for adventure. Maybe tiny house with a big yard? Thanks, Emily. If we end up making this dream a reality, we'd love to host you guys for free to make up for all the great books you send us! The dream definitely involves a good bit of land. We imagine a big farmhouse on a few acres, with a handful of tiny homes in a bunch out back...like little chicks hiding behind the mother hen. Mrs. Done by Forty insists that we show movies for free every Friday to our guests and whoever wants to come from town, too. We'll project our favorite movies onto a white sheet hung on a clothesline, while we hand out paper bags of popcorn she made on the stove. This is so cool! I'd love to have the chance to try tiny-house living sometime; it's something that has always appealed to me so I'd be interested in seeing if the reality lived up to my expectations! Hi Kali. I know of a few tiny house rentals (one in LA and one up in the Pacific Northwest somewhere) from the tiny house blog. They might give you a chance to try it out for a night or a week. I really like the floor plan of the link you shared. The house looks really cute on the outside, too. It's great that you have a chance to experience a week in a tiny house. I imagine dogs and kids would make it a lot tougher to tolerate. As it is, my two cats seem like they would benefit from a bigger apartment, but the space suits us fine. I'd love to have a house on the smaller, functional side. There is a resident cat that comes into the loft with us when she feels like it (and attacks my feet like a wild animal). I think a cat or two would probably work out fine, but a dog would be harder to deal with, especially with the ladder/steep stairs to the loft. That's a cute little place! I'd have to agree on the tiny homes with your wife. It's a fun little novelty in the short term, but it would probably get on my nerves. Maybe if it was just me...but two or more would be really hard. Tonya, I sadly have to agree. I think tiny house living will have to be a dream deferred...for now. Maybe someday I'll build one in the backyard for fun though as my "office" (i.e. - treehouse for grownups). That is such a cool living space!! I agree that it's good in theory, but probably not for long-term practice. :) So glad to hear you're doing well and having fun with the Mrs.!! Thanks, Anna. We really liked the place, too. It was a one of a kind experience for us. Great post Done by, I had always wanted to check out Airbnb, and perhaps next summer on a trip to Montana I will. Glad to see you are in Ecuador, and you are right 2 adult and a couple golden retrievers would be tuff in a 200 sq foot home. Thanks for sharing tumbleweed small houses, very cool! I never heard of it and likely never would have had I not read this! Safe travels home and happy Thanksgiving to you and Mrs. Done by! Tumbleweed's designs hit a sweet spot for us. They're preposterously tiny but seem to have really quality touches. I guess if you're going to live in 120 square feet, you want those feet to be posh. That's a really nice place, actually! At least when on vacation, you really don't need something huge. And good to see that Airbnb is working, I was too considering using it for our trips around Europe. Regarding the tiny house... it might not be as nice as it sounds in the end - I am living in a relatively small place with my wife and Baby Romanian and it gets frustrating after a while when you simply have no place to deposit your belongings (even if you don't have many). That's reassuring to hear from someone who's living in a small space with children now. Sometimes I get excited about things without having much experience with them. A dose of reality is a good thing. No problem, Melanie. 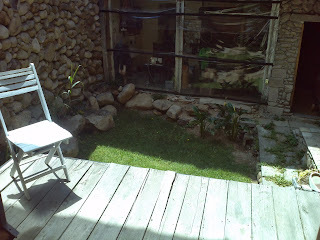 The owner (Manolo) is an architect who built it himself. If you're interested in connecting with him, just shoot me an email (or contact him directly from his Airbnb link). 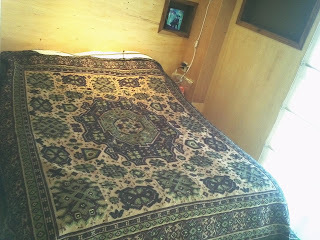 Our last place was a tiny little studio with a small loft where we put the mattress. No closets. We had clothes hanging on the walls. It was an interesting experience and certainly fun to look back on, but it would have been awful to have a child there and personally I need for space. As much as I love everyone in my family it's nice to have the option of separation from time to time. Matt, that just sounds like a really cool living situation. There's something about a loft sleeping area that designates you as a hip person. I agree about needing a little space from your loved ones though...something about a room of one's own. We have never done Air BnB before. I would definitely try it! I dunno about small house living now that we have kids. I can definitely do a smallish house, or a medium house though. I'm pulling for you guys to go small after your renting experience! But kids throw a wrinkle into those plans, I think. They need a little space to run around in. Pretty cool...we may have to check out Air BnB the next time we travel. How much would a hotel room have cost? Interesting that you are fascinated by tiny homes. Here in NYC...there has been an increase of these "micro apartments" from 250 to 325 square feet being that space is at a premium here. It's apparently a new trend for people who must live in Manhattan but couldn't afford it otherwise. Still pretty expensive though with rents over $1000. No thanks. But it is fascinating how neat and well organized people keep their tiny apartments. Plus every available space is used efficiently or has a dual purpose. It does look pretty cozy. Hotels were all over the map, from about $50 on up. Oddly, because they charge by the person, hostels weren't really much cheaper. I agree on the efficiency of a small space. I think part of the allure for me is that I imagine a very organized, minimalist image of myself. As if the place will transform my habits. I doubt it'll be like that in reality. I think I could live in a fairly tiny home. Not 240 sq ft maybe like 500 sq ft at the very smallest. But I don't know if I'd want to do it full time (especially with two kids) At least you got to try the tiny house out though. Hope you and the Mrs. are having an awesome time! Thanks, Alexa. We definitely had a great time, though now I am back home and away from the missus again (sob). I'm with you on the size of the home now. I'd need double or triple that space to feel like it was sufficient for the long haul. Back when I was single and in college though...this would have been perfect. I love the idea of a Tiny home but probably wouldn't like living in one - a small apartment will do just fine! We used AirBnB on our last trip to NY and had a brilliant experience! Yeah, the idea is alluring but I think it's a big adjustment in reality. I'm all about Airbnb now though. I will start looking there first instead of Orbitz or Travelocity. Hello, first time commenter.. I like your blog. I also love AirBnB and have been using it for over 3 years. Just recently had our first bad experience in Florence, but it won't hamper our upcoming Marseilles, Amsterdam, and Budapest reservations. The hosts are usually so wonderful and always go for the airbnb verified photo ones, and read the comments. When they speak of the hosts only,but not the flat itself, worry..
Hi Kemmy. I'm glad you commented! Your trip in Europe sounds fantastic. Any advice you could give on those places would be welcome. We're planning on traveling abroad next year and often end up choosing a place based on recommendations from others. Wow, love that little place! It's just so compact and the layout works really well. My hubby and I have a distant dream of living in a log cabin. However I don't feel comfortable with the UK weather and the impact that would have on our living conditions! I think the main worry I'd have with a cabin is being so far from the city, friends, etc., and the time/cost it would take to go everywhere. If you could set one up in a neighborhood, that'd be fantastic. That's pretty cool DBF. I wouldn't mind a tiny house when we travel but not to live in. When do you get back to Arizona? Hi Charles. I just got in (after 48 hours of transit, sleeping in airports/planes...not great times). I think I'll do as you suggest and get my tiny house fix on vacations only. I wonder what is tiny and what's too big? I was in 66sqm (710 sqft) and it was manageable - you had to be tidy though. Admittedly it was pretty big imo? And I could have lived there with a partner, and at least a baby. The bigger place I have now, lots of space isn't actively used, but still needs cleaning! I've used wimdu.com which is airbnb in another way, it worked well for Paris! Paris? Oh, my wife would be so jealous. We want to go there soon. I'm not exactly sure what qualifies as "tiny" vs. "small" but I've heard the number of 400 square feet and below being "tiny". I'm sure it depends on who you talk to though. $15 a day for a private room is a rockstar deal. I personally LOVE airbn'b. I've used it both to stay cheaply and to earn extra income. That's cool that you've used the site as a seller, too. Were you happy with the money you got vs. time/effort you put into it? We rent out a room full time now, but short term rentals might be a nice alternative that give us back our home some days. I have never heard of this service but it sounds great! $15? That def. sounds like a deal to me. Yeah, it was a steal. It worked out to be a bit more once the Airbnb fee was included, but still. It was a cheap room, for sure. Aren't the mesdames always right? ;) I really don't understand why they keep on advising women to look for Mr. Right. Kidding aside, the place looks really cool and cute. Looks like it can be spick and span in 10 minutes of cleaning. Yeah, when we left we cleaned up and it took all of 15 minutes. We kept checking for stuff we left behind but it's actually really hard to lose anything in there. It's just one room, and there's no place to put down/lose anything. This looks exactly like something me and Mrs. HopeToBeDoneByFifty would love! I'll have to look into AirBnB for our next excursion! Enjoy the rest of your trip, and a Happy Thanksgiving to you both! Thanks! I'm back in town, buddy. Let's grab a beer sometime this week and catch up. Nice deal on the place! So glad you're enjoying your visit!!!! So exciting! I hear you on the whole having a family killing the little house dream. Have you read Little House in the Valley's blog? Might help you get your fix along with Tiny Houses. Hope you had a great Thanksgiving? Supposed to be a ! not at ? Sorry. Thanksgiving was great, though I forgot to bring the cranberry sauce and green beans, so we had to go out for a chicken dinner instead. No biggie! I've always been interested in these Tiny Houses, but I'm not sure it would work for our family of four right now. Maybe sometime in the future!